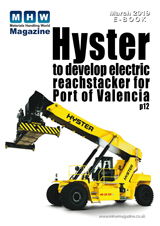 Hyster’s Empty Container Handlers have seen several new developments in 2010 in addition to the well reported XTL axle that reduces tyre wear and costs. The new ‘lay-back’ mast options on the H16.00-22.00XM-12EC, enables the truck to pass easily underneath overhead obstacles, which are commonly found in port and terminal environments, such as bridges or pipelines, where previously the mast would have to be dismounted. This model provides up to 8 high stacking capability with class leading lift speeds and a rear mounted cab for excellent visibility. On the ‘hooks and side-clamps’ EC spreader option, Hyster has also further improved visibility by re-positioning the vertical end pillars and the work lights, useful when the spreader is in the 20′ retracted position. There is also a new ISO / European Union* ruling that affects empty container handlers, unless they are equipped with twistlocks. This means empty container handler versions with hooks and side-clamps will have a conditional travel speed limitation of 10 km/h, if the side-clamps are not moved into the ‘closed’ position by the operator. Four versions of ‘hooks and side-clamps’ are available which means there is now a total of nine empty container engagement systems on Hyster’s H16.00-22.00XM-12EC. The ‘suspended hooks’ EC spreader version is no longer available. There are new options available across the entire Hyster Big Trucks range, which focus on maximising driver comfort and efficient operation, including an operator presence feature, where the engine is shut down when the seat is not occupied, to help reduce fuel consumption (more environment-friendly), a preset travel-speed reduction function, a ‘DeLuxe’ air-suspension seat with heating option, high output air-conditioning and climate control.